The Member Database is the core of the system, and it lets you efficiently manage your members and track your prospects and other non-member types. Online Member Registration - allow new members to join online and pay dues via credit card. Member Agreement - require agreement to a legal document before allowing a new member to sign up. Welcome Message - customize an automatic welcome message for new members. Pending Approval - optionally, pend new members for approval. Discount Codes - offer discount codes during membership drives. Membership Plans - offer differently priced membership plans with different terms; offer annual, quarterly, or monthly memberships. Prospect Conversion Tool - in broadcast emails, include a link to constantly remind prospects they can join with 1-click. Membership Card - offer your members a printable membership card. Dynamic Custom Fields - collect information specific to your organization; fields can include short text, long text, indicator, select, multi-select, date, integer number, and decimal number; different data can be collected for different member and non-member plans. Admin Fields - admin fields can only be viewed by admin-level users, which allows admins to privately record notes on prospects and members. Custom Reports - build stored queries; produce exports, postcards, mailing labels, member lists, and other custom reports via an easy-to-use tool. Cross Reference / Sub-Members / Accounts - optionally, allow members to add additional people under their membership; this can be used to allow for additional employees to be listed, family members, or whatever suits your association. 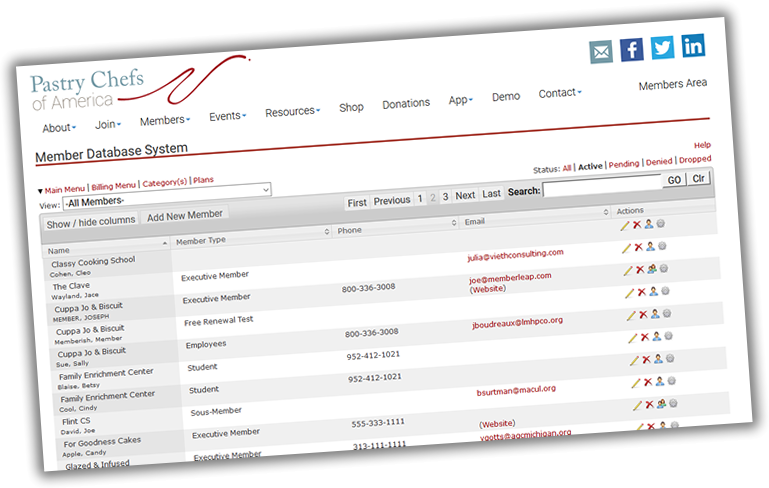 Projects / Committees - keep track of subgroups within your organization; also includes communication tools to allow subgroups to communicate with one another and have their own web page; great place for your board of directors, event committee, sponsorship committee, etc. Email/Newsletter Lists - allows you to manage a variety of lists for email distribution or mailing of publications. Business Categories / Product Types - for members that are businesses, assign them to multiple categories or organize them by the products/services they offer; this allows admins to communicate with select members; this also allows for members to be searched on by these fields in the member directory. Address Fields - the system has an optional feature to have multiple address fields per member - main address, alternate address, billing address. Member Photos - allow members to upload a photo of themselves or a logo; alternatively, you can grant them the ability to upload entire volumes of photos. Member Documents - allow members to upload relevant documents (ex: licensure, certification, resume, company brochure, event flyers, etc.). Permission/Security Levels - there are multiple ways to grant access to your admins, board, and members; with this, you can be sure to grant access to who need it and hide features from people who don't need access. Member Number - allow for automatic generation of a member ID number. Referred-By Tracking - keep records of how your prospective members found you. Profile Field - for member directories, allow members to create rich-text content to display within a directory. Quick Add - will show a subset of fields to allow for easy adding of members. Data Upload - if you need to frequently add many members at a time, ask us to turn on the member-upload feature. Member Change Tracking - reporting is available to see who last changed a given record. Member Change Notification - if a member changes their profile info, you can (optionally) receive a notification email. We offer a variety of standard directory types and formats to present member lists both public and private. All of our website packages and integration packages include member data conversion, where we take your member data and load it into the system for you.